Beginning Sept. 1, Paula Herbart will serve as the new President of the Michigan Education Association. Jessyca Matthews, a Flint high school teacher, is among seven finalists to become NEA’s 2017 Social Justice Activist of the Year – and you can help her win by voting! Educators in some Michigan communities with large immigrant populations say they’re increasingly worried about rumors of federal raids that might be conducted soon by officers with Immigration and Customs Enforcement. 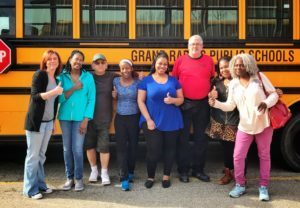 Bus aides in Grand Rapids concerned about working conditions and a lack of job training have secured union representation for the first time with a unanimous vote to join the transportation unit of the Grand Rapids Education Support Professionals Association. Next week on May 1st in cities, towns, and communities across the country, activists will Rise Up to demonstrate the power, resistance, and strength of a social justice movement that is gaining strength and influence by the day. Change is happening – in town halls, in school board meetings – and in the streets of America.